I'm not sure this fits into the catagory of necessity being the mother of invention...but invent tonight I did - and it was a grand success! I have this little quirk that I have a hard time eating something I have recently thrown up...its been YEARS since I've eaten alphabet soup. But I digress. Tonight's menu plan was just a little too close to my Thanksgiving Eve puke-fest prior to emergency gall bladder surgery...ANYWAY. I invented the following...and boy was it yummy!! Bag of frozen broccoli and cauliflower. Cook per package directions. Sprinkle on a little bit of soy sauce and a small dab of butter. Melt the butter and serve. Preheat oven to 375. Peel enough carrots for your family. Cut into short, thin sticks. Line cookie sheet with tin foil and spray with olive oil cooking spray (regular would probably work fine too). Lay carrot sticks out in one layer...I tried to not have them touch so they would cook quicker. 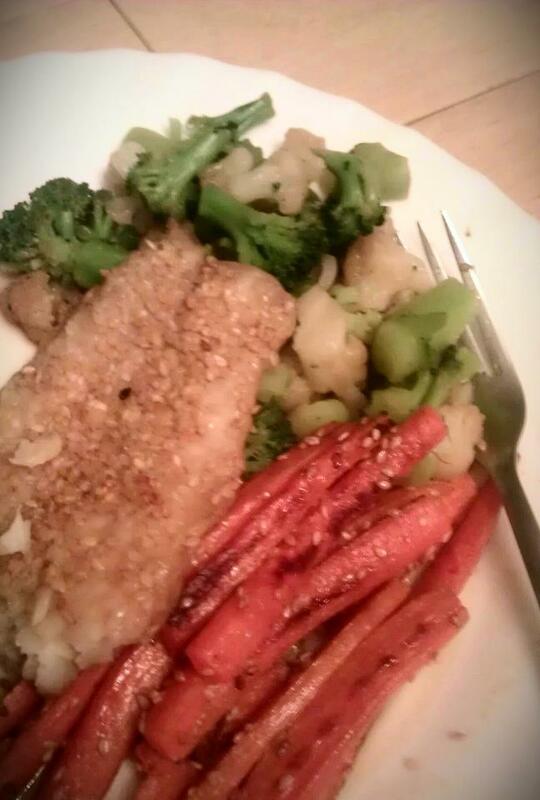 Spray the top of the carrots lightly with the cooking spray and then drip a tiny line of sesame oil over the carrots. Sprinkle top of carrots with sesame seeds then mix the carrots up a bit and lay them flat again. Bake the carrots until they are soft enough for you. I baked mine approximately 20 minutes, shaking the pan after the first 10 minutes. Serve. Place fish (I used swai) on a double layer of tin foil. (one piece of piece per foil packet) Mix a small amount of sesame oil and peanut oil and spread over the top of the fish. Flip fish over so oil gets on the tin foil. Flip fish back over so bottom of the fish gets a coating of the oil. Slightly fold up the edges of the foil layers so that the next bit of sauce doesn't spill onto your counter. Mix a bit of (the amounts are dependant on how many pieces of fish you have) rice vinegar and soy sauce together. Spread enough on the fish to thoroughly coat. Flip fish and coat the other side. Sprinkle top of fish with sesame seeds. Fold two sides over the fish and then fold the remaining two sides to create a packet. Grill on high for approximately 10 minutes. Open the packet(s) and put the whole thing in the oven on broil. Broil for a few minutes until the sesame seeds have toasted a bit. Serve. The fish basically steamed in the packets on the grill, so the fish was very moist and yummy. i love it when invented meals work ! ps ... this sounds yummy !